The money origami website is a great resource for teachers who want step-by-step instruction for origami. The models include: Boots, Bow Tie, Butterfly, Eyeglasses, Fan, Gift Box, Picture Frame, Ring, Sailboat, Serpent, Shirt, Spider, Valentine and Xmas Tree. 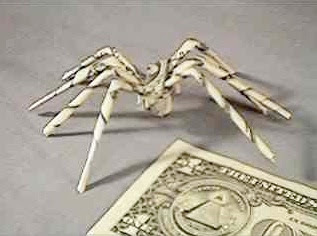 All the models are made from paper bills and step-by-step instructions with pictures at each step are included. It also includes links to other website containing instruction to make origami. The models also make great gifts for special occasion such as mother's day or father's day. Posted by Dominic P. Tremblay at 10:02 p.m.
April 11, 2011 at 6:27 a.m.